In any case, the only Grand Theft Auto I've played is the original: Grand Theft Auto (1997) and the only exposure I ever had of the modern 3D incarnation is from commercials. 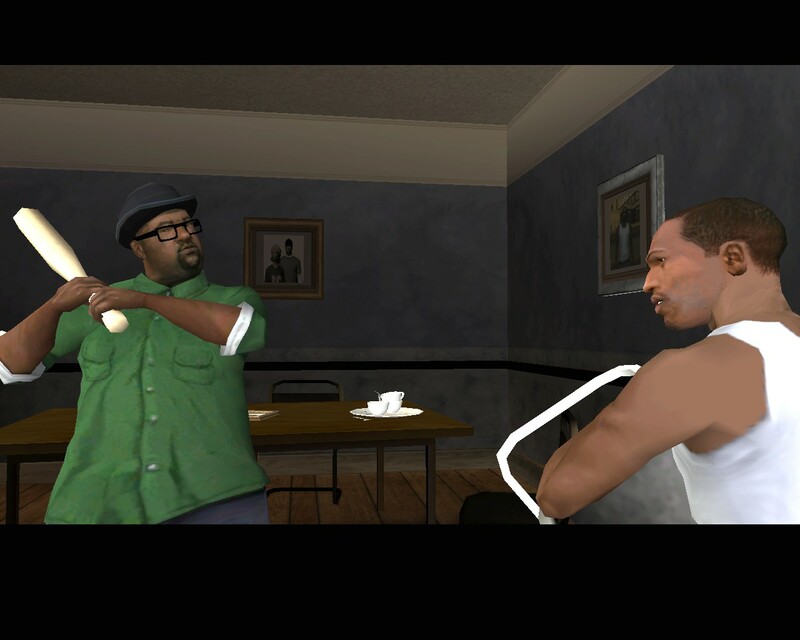 As such, all I could picture was the original, mission-driven Grand Theft Auto in 3D and with more violence. 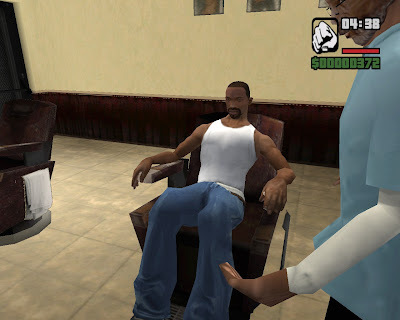 However, upon running Grand Theft Auto: San Andreas, I was surprised by the story and some of the gameplay mechanics being introduced. Riding your first vehicle: a bicycle. With that being said, I am not entirely fond of the bike controls. Related to this complaint deals with controlling the camera. Maybe there's something I'm missing. Of course, a positive trade off is the player can lean forward or back on the bike using the mouse, and in particular, one can do a wheelie. 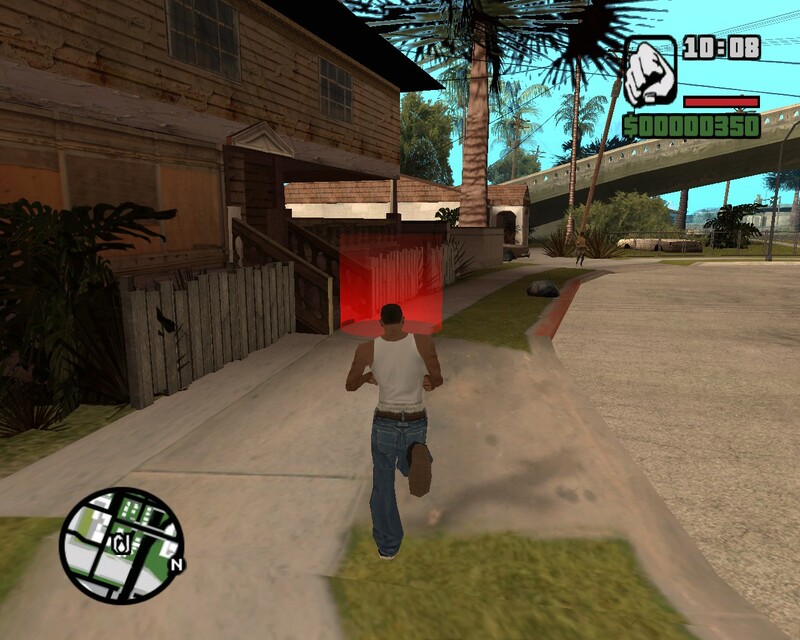 Holding the control button puts the character in position for a bunny hop and releasing the control button will execute the bunny hop. Customize the look of your hair at the barbershop. 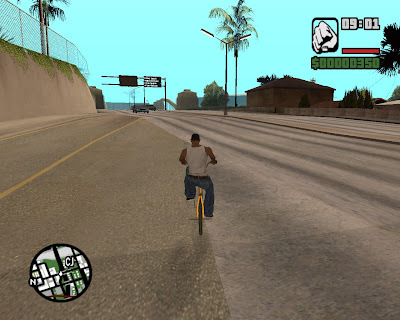 So the game definitely provides the player with little details such as adding a bunny hop to riding a bike. Other details include being able to change the radio station or changing your hair style. Of course, a change in hair style will cost money, and the combinations and possibilities are preset, but it's still nice to have some options. There also seems to be a car paint shop and tattoo shop, but I haven't visited them yet. Actually, the only reason I went to the barbers was because the game instructed me to. So those were some cool features to include with the game. 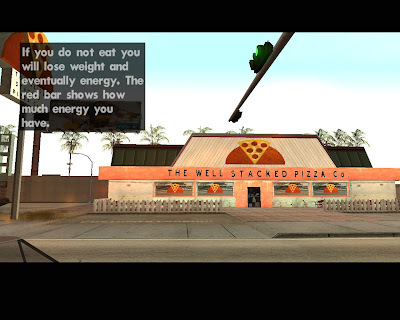 The next feature, on the other hand, is something I would expect to find in The Sims, but not in a Grand Theft Auto game: eating. I have to feed my character? Sure it adds to the realism, but I feel like it would also get in the way of just trying to finish the game. I guess I'll have to play more to see. The game basically tells you that purple is bad and green is good. Then the last game element I'll mention here is tagging. Spread throughout the city are purple tags and you should use your can of spray paint to cover the purple tag with your gang color, green. Overall, I can see why this is a great game. One thing which is new to me, is the violence involved paired with the realistic setting. This contrasts with the violence in Street Fighter or Metal Gear Solid. In other words, the plot of Grand Theft Auto: San Andreas is plausible. In this sense, I'm on the edge of whether or not I'd want to play more of it. This contrasts with the feeling I had when I started playing Portal (2007) or Portal 2 (2011). I just couldn't stop until I needed sleep or finished them. In terms of open world games, I've played Red Faction: Guerrilla (2009) and would prefer to play that.